The most important concept for us is the safety of our passengers. We want you to feel safe with us and that includes keeping our school busses in exceptional condition. For the safety of every one of our passengers and the other drivers on the road, Oliveros Transportation hires the most qualified drivers possible. Safety conscious individuals are the cornerstone of any trusted transportation company. If you need a school bus for your little ones or transportation for the jobsite, we can get you there safely. We begin by hiring the best possible people for the job. We ensure that our drivers and equipment are both of exceptional quality. In-house maintenance personnel inspect each of the busses on a weekly basis but more importantly, every month the busses are inspected by an M-DCPS representative, the same rigorous inspection system that the M-DCPS uses on their own fleet. 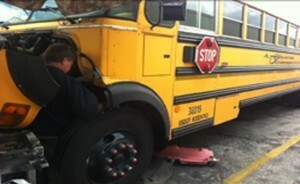 Monthly inspection will ensure that the vehicle is up to the same standards as the public school busses. An important part of any vehicle operation is a concept that has gained traction in recent years, 360 degree awareness. 360 degree awareness is the concept that a full walkaround is necessary before getting in the vehicle. The walkaround is the first line of defence in preventing subtile safety issues. A walkaround is the best practice whenever starting a vehicle. At Oliveros Transportation we believe that being responsible for transporting your child to school is the greatest privilege that a parent can give us. So call today and let us get you there safely.